In order for you and other players on the course to enjoy your round of golf, Worsley Golf Club expects members and visitors to observe the basic rules of course etiquette. Course etiquette is simply a set of good manners which have been adopted over the years that are intended to keep the course in good condition and prevent slow play. The following guidelines are intended to give less-experienced players a basic grounding on what to do (and what not to do) on a golf course. The maximum game permitted at Worsley Golf Club is a 4 ball. Players are not allowed to share a bag of clubs. Do not distract your partner by either talking, moving or standing too near when he plays a stroke. The player who has the honour from the tee should be allowed to play before their opponent tees up their ball. Do not shout, swear, or throw your clubs if the shot you hit is not absolute perfection. No trolleys on greens, green approaches, bunkers and tees. Repair ball pitch marks on greens. 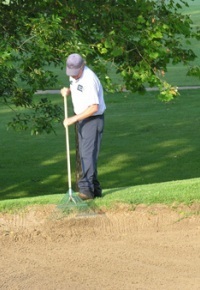 Replace all divots (turf cut or displaced) while playing. Rake over all footprints and other marks made in bunkers. No practice swings on tees. Players should be ready to play when it is their turn to play. However, they should not play until other golfers or greens staff are out of range. Make sure when you practice swing that you do not endangers one of your partners or caddies. Shout "FORE" if you think that a stray shot might hit someone. It is the responsibility of every player to play the game at a good pace. Players looking for balls must allow other matches coming behind to pass. They should not wait for 5 minutes before so doing. If a match fails to keep its place on the course, and looses more than 1 clear hole from the match in front of them, and is holding the up the match behind, it must invite those playing behind to come through. The match being held up may also request to play through. Any Mens or Ladies Competition matches may claim the right to pass 'non competition' games. If you play a bad shot and suspect that the ball might be lost, play a provisional just in case. Do not take an excessive number of practice swings. Players who have holed out on the green, should not try their puts again when players are waiting to play. Before putting, always leave your bag or trolley alongside the green nearest to the next tee. When you have completed the hole, clear the green quickly and mark your scorecard as you walk to the next tee.